Yep, I’m pregnant! Over half way to meeting a sweet little sister baby to fill the shoes of littlest loaf in our family. Nino, recently turned two, isn’t quite sure what to think and alternates between kissing and cuddling my belly and pushing it out the way as he fights his unborn sister for space on my ever expanding lap. Having the genes he does, he’s particularly interested in what she’ll eat – we’ve decided on milk for now, mashed banana and ‘baby slop’ which he’s noted friends’ babies spooning down with the dismay of an all-but-one-toothed omnivore. Our littlest loaf is due at the end of summer and it’s starting to feel very real. The sickness (which seemed to last an age, thanks for those hormones, baby girl) has finally started to subside and I’m no longer craving vinegar every minute. Sharp Granny Smith apples have been a staple, less of the sweet, more savoury, although I’ll happily still wolf down a bowl of brownies and ice cream if given half the chance. My belly has started to pop – there’s really no messing about second time round – and I feel like that slightly dumpy phase is blooming into all the benefits of a seat on the tube and kindness from strangers (alongside the slightly less welcome stomach gropes). 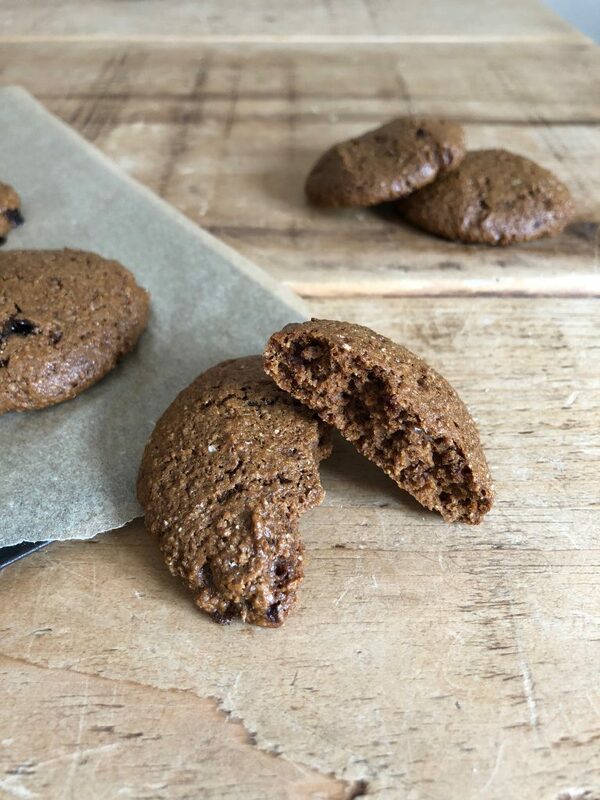 As with Nino, my sweet tooth was dormant for much of the first three months, but when I did get a craving these ginger molasses cookies did the job. Ginger is well recognized for nausea relief and if you’re suffering from that all day hangover vibe ‘morning sickness’ that seems to have haunted both my pregnancies, I’d highly recommend this recipe. There’s a double hit of ginger in the form of powdered and fresh, the latter giving them a satisfyingly fiery kick. 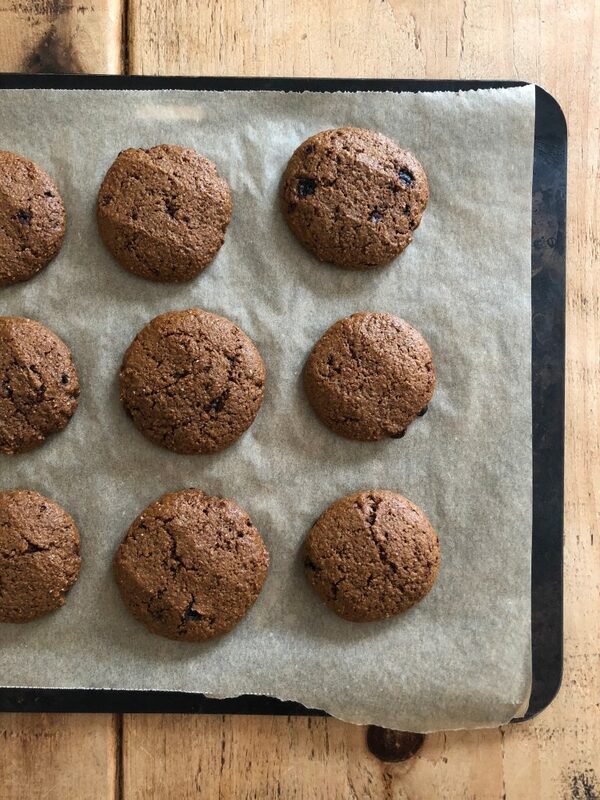 There’s fibre from the wholemeal spelt flour and iron, magnesium, potassium and a gentle sweetness from molasses. 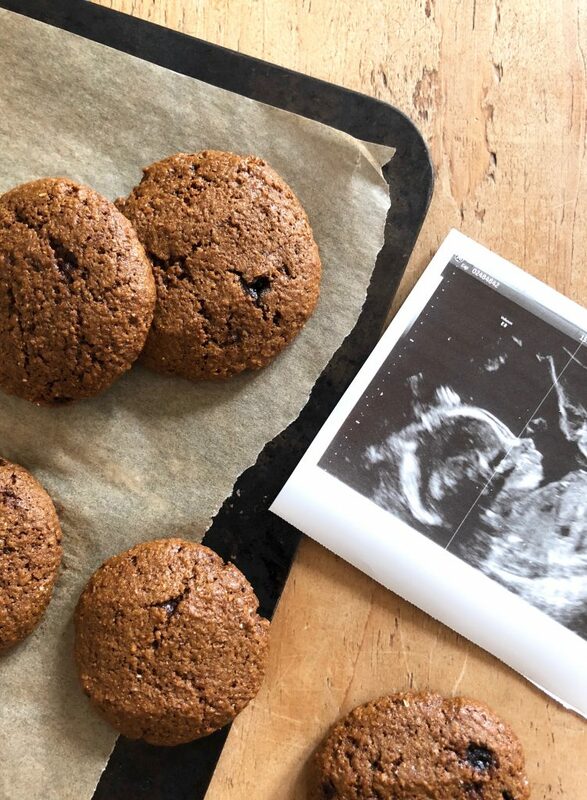 I wouldn’t exactly call these a health food, but if you’re looking for a wholesome snack or after dinner treat to settle your stomach, pregnant or not, these simple cookies do the trick. 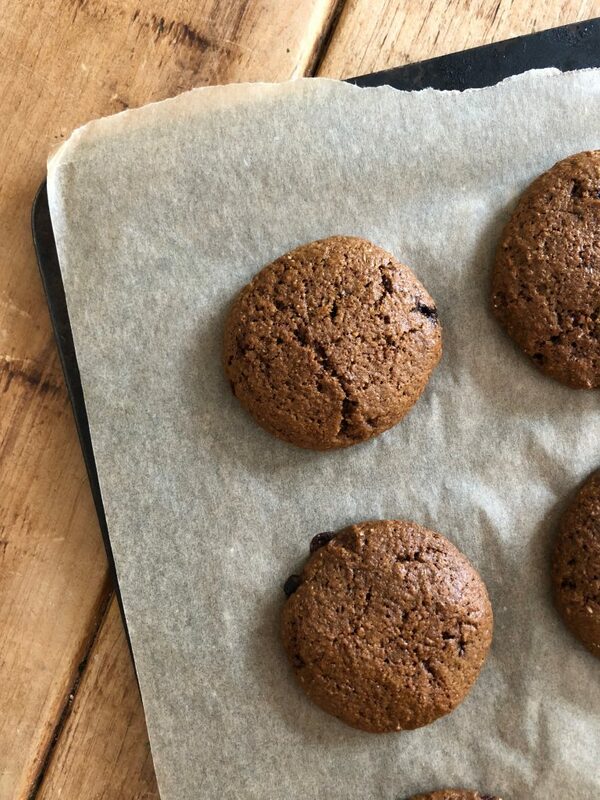 Crisp edged, chewy middled cookies with a double hit of ginger - the perfect afternoon pick me up, an antidote to pregnancy nausea or even crumbled over ice cream for dessert. In a large bowl, whisk together the flour, baking powder, spices and salt. Stir in the sugar. In a separate small bowl, whisk together the molasses, coconut oil, egg and ginger until smooth. Stir the wet ingredients into the dry until combined then chill for 30 minutes. Preheat the oven to 180 C/160 C fan and line a large baking tray with parchment paper. 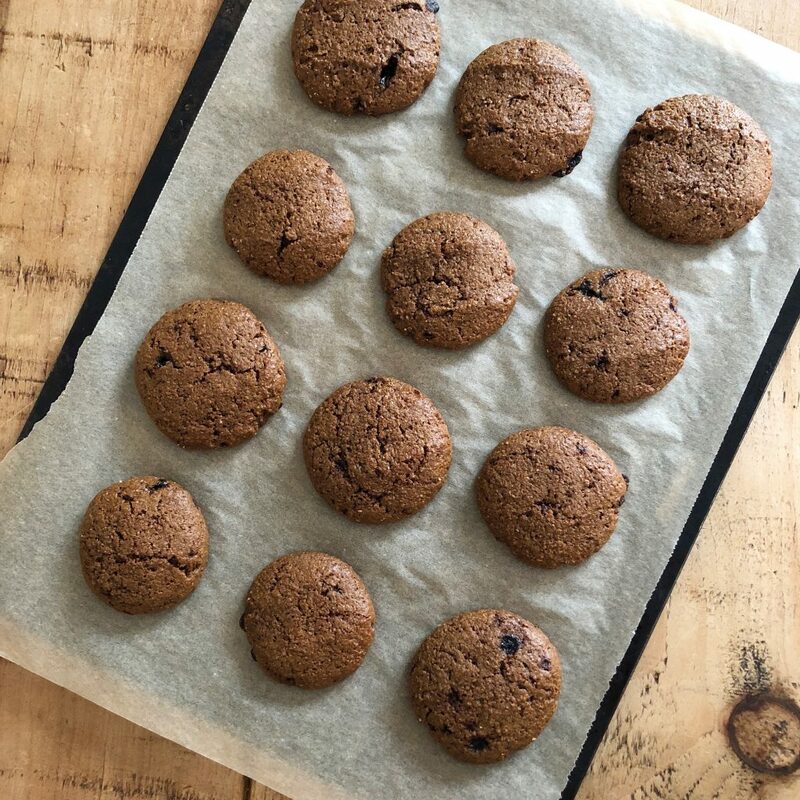 Scoop out heaped teaspoon sized balls of mixture and roll into balls, then place on the tray and press down slightly with your fingers to flatten. 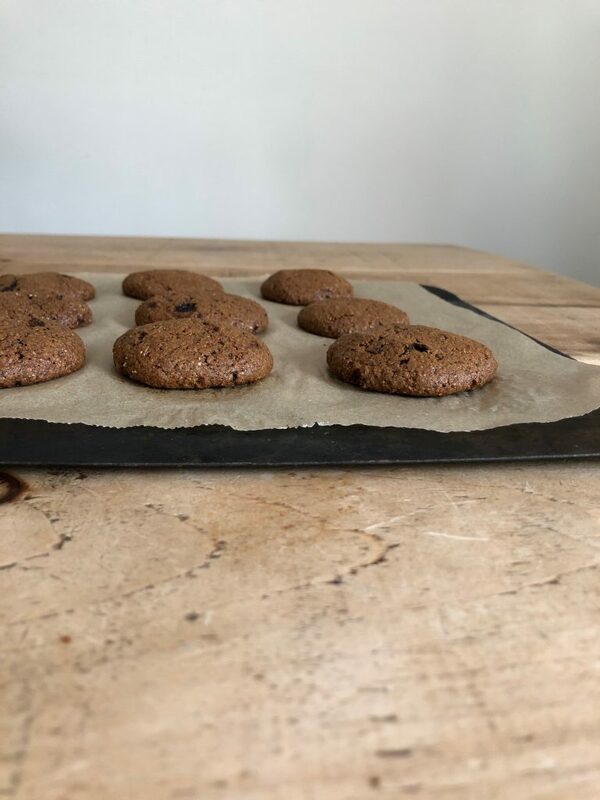 Bake for 12 - 15 minutes until firm and a little darker round the edges (it's hard to tell by colour as the mixture is so dark, but it will get a more golden hue). Remove from the oven and allow to cool completely on the tray. Will keep an airtight container for several days. Huge congratulations on your exciting news. Lovely cookies too. Congratulations on your baby on the way! Wonderful. The cookies look sooo good . 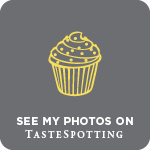 I love spicy ginger cookies full of molasses. Ahhh congratulations! These look so tasty. Wonderful news! Love these cookies! Congratulations! How wonderful. 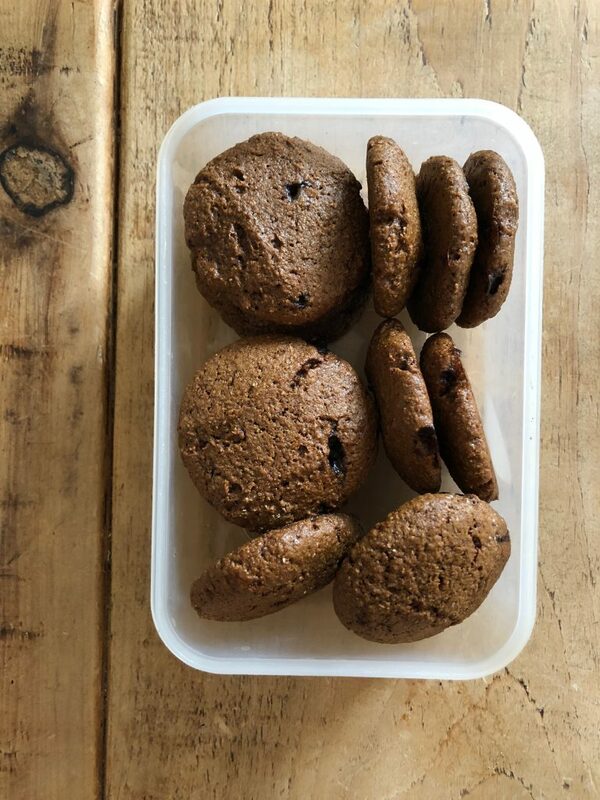 And thank you for the recipe – made them this afternoon, during my almost two-year-old’s naptime, for a neighbour who is at 30 weeks and she loves them. Thank you from us both!